Easter Monday has been a dismal day by any standard. It makes all the more vivid the first shot in the 48-minute documentary for “Heno.” Gareth John Bale is in Times Square. The towers soar, the sky above New York in winter is a brilliant blue. The film is an arts programme but not restrictedly an arts programme. “Grav” itself is a work of theatre biography and the makers swiftly cut back from America to Wales and to the life. Scenic shots of Kidwelly, the view to the Gower and Mynyddygarreg follow the opening in Manhattan. It is an emotional film, intended as praise, not discredit. The place of theatre is to elicit emotion- if it cannot do that, it is not up to much. The interviews in Carmarthenshire encounter familiar faces. Delme Thomas on his rugby team mate: “he got on with everybody and was incredibly funny.” Dafydd Iwan recalls being joined on stage: “he sang three songs and was word perfect.” Library film footage revisits the Eisteddfod and a scene on stage. 10,000 people join at Stradey Park and not a pin drop is to be heard. The film records a 10 year memorial dinner in 2017 and includes coverage of the work of the charitable Trust. The film-makers visit the Meurig Williams Community Diabetes Centre and a special club at Carmarthen's swimming school. There is a final note to this section of poignant tribute from the two now adult daughters. Around two-thirds of the film is located in Carmarthenshire before the jump to the Torch. 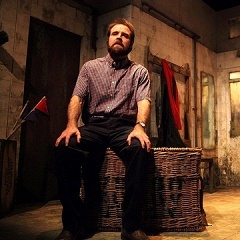 The tale of “Grav” the play is economically told with the editing focussed on Gareth John Bale. The makers are keen to catch the performance itself but, in addition, as a speaker offstage he is fluent and modest. At the New York venue it is up to him and he shows the tiniest bottle cap's worth of strengthening Irish whiskey. Before these last performances there has been footage from the Fringe. The performance space has shrunk and travel has lost the marvellous set that featured in the review from Felinfach (below March 2015). At the Wales Theatre Awards the company gathers on the Sherman stage in a collective delight. Peter Doran is interesting on how a hit lifts a whole theatre. Live performance has that infectiousness. Before the cross-Atlantic departure “Grav” plays Ffwrnes. The audience as elsewhere is rapt. “It was full of emotion and humour” says an interviewee. Television does not often visit theatre; this is a full film of the life and the play.